I have been posting books this week for young readers and their families that are trying to balance the secular approach to the Easter season with a more spiritual sense that precedes the arrival of Easter Sunday. While there is certainly nothing wrong with Easter egg hunts, Easter finery and the celebration of Easter baskets piled high with chocolate rabbits, jelly beans and the like, many families today are trying to balance today’s culture of “More” with the question of “More what?” and how can we BE in the world what we want to SEE in the world? And so, we may try to give our young readers books that balance the secular parts of Easter reflected in the newness and rebirth of life with the timeless lessons of Lent and Easter that are, and dare I use a much forgotten word called….SACRIFICE, as opposed to the ever-popular SELF? Glenys Nellist has written what I consider a fine exposition story telling picture book for children of the events leading up to Easter. If you wish, it leaves a place where it may be addressed to your child. Something so personal is important in a world where God may seem like a very distant concept for children. The letters are written from a father’s viewpoint about why his son has come to earth in order to be his symbol of love in the world. And, they are quite touching when read to your child from God the Father’s viewpoint. Interspersed are opportunities to read quotes from the Bible, entitled, “God’s Wonderful Words to You” that reflect the emotions and events spoken of in the stories that unfold in Holy Week. The book is very well done for young readers, and the Crucifixion, which is always a conundrum because of how children can react with such depth of feeling concerning death, is handled with sensitivity. Sophie Allsopp’s art is wonderful in that it hits exactly the right notes of joy and sadness when it needs to, and illustrates the ag- old story of sacrifice, love and resurrection with restraint coupled with radiance. 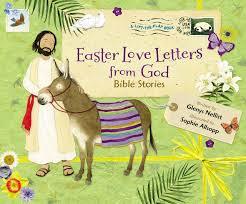 “Easter Love Letters from God Bible Stories” by Glenys Nellist and illustrated by Sophie Allsopp is a great addition to your children’s library if you are searching for a fine way to balance the secular part of Easter with, to my mind, the much-needed spiritual, that the world is much in need of. Spiritual sentiment. It had reminded me to be honest & open about my own beliefs, especially to my grandchildren.